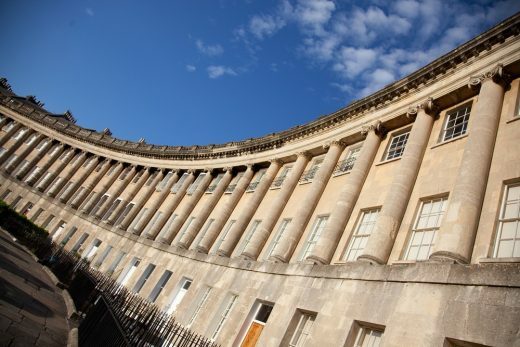 Celebrate 250 years of the iconic Royal Crescent, a masterpiece of the architectural innovation and creative imagination of the Georgian era. 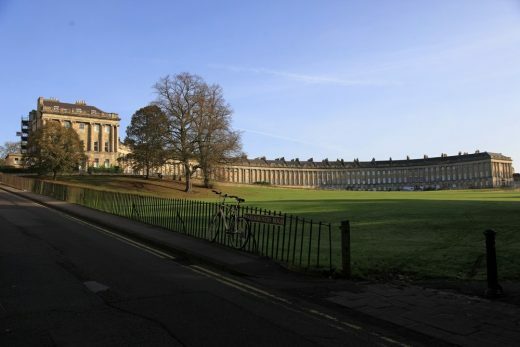 Since the foundation stone was laid on 19th May 1767 the Royal Crescent has become one of the most famous buildings in Britain, and provides a doorway through which Georgian history can be explored. 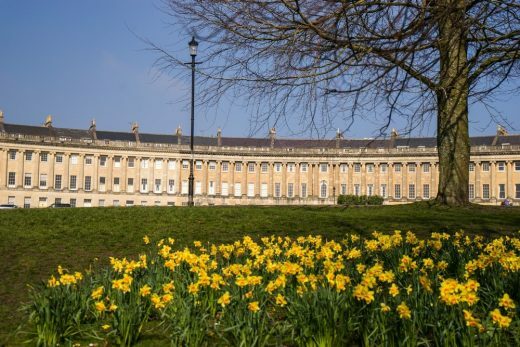 No.1 Royal Crescent and The Museum of Bath Architecture will be holding new exhibitions and events through which the architecture, history and influence of the Royal Crescent will be explained. 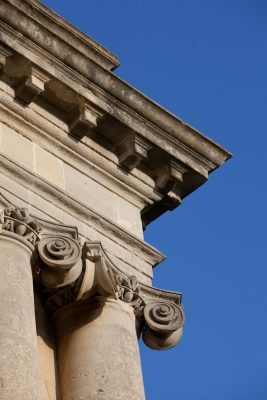 At No.1 Royal Crescent From Rome to the Royal Crescent will trace the evolution of classical architecture through the intricate models of Timothy Richards. 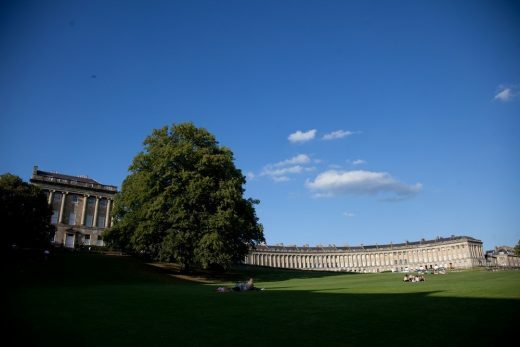 A View from the Crescent will explore how No. 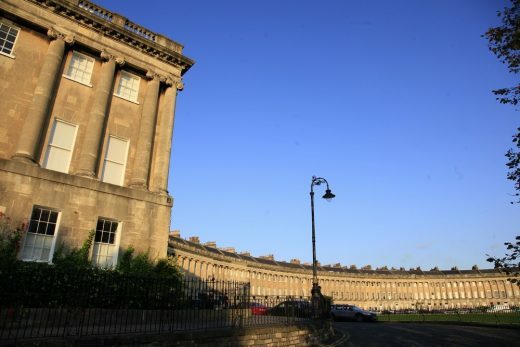 1 Royal Crescent has been portrayed by artists in the past whilst New Views will exhibit artwork produced by the local community and inspired by the Royal Crescent. 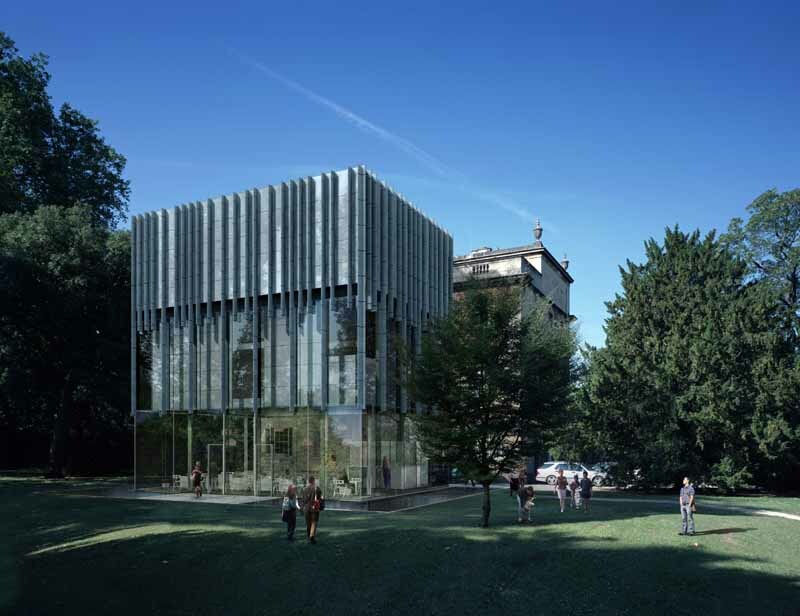 At the Museum of Bath Architecture Royal Crescent Deconstructed/Constructed explores how the Royal Crescent was built, whilst Past, Present, Future: Bath, Modernism and the Smithsons explores how the Royal Crescent inspired England’s most influential post-war architects. 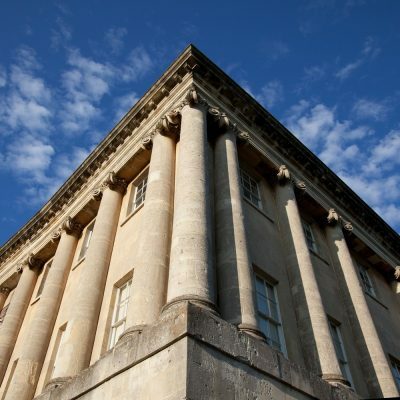 A busy programme of over 70 events will include lectures, walks, workshops, film screenings, family trails and concerts. 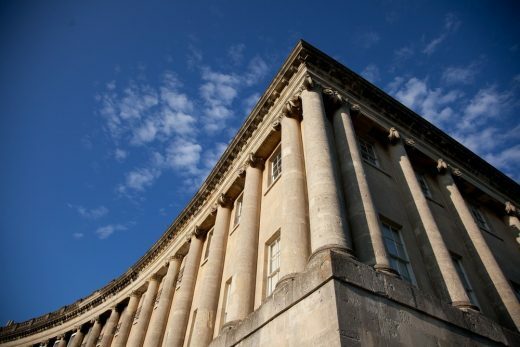 Visit the Royal Crescent on the evening of 19th May for a magical night of poetry and illumination as famous verses are projected onto the iconic façade. 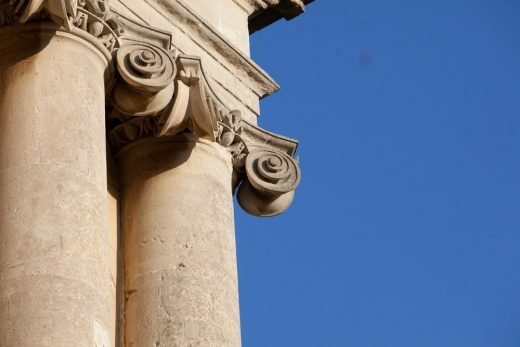 Join the Natural Theatre Company on their Foundation Stone Day Grand Parade (21 May) as they transport a piece of Bath stone from a quarry, through the city, to No. 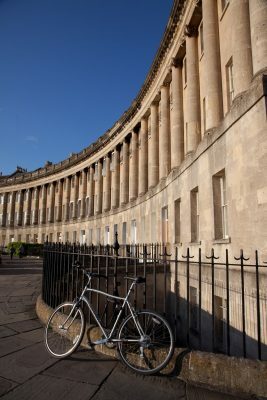 1 Royal Crescent. 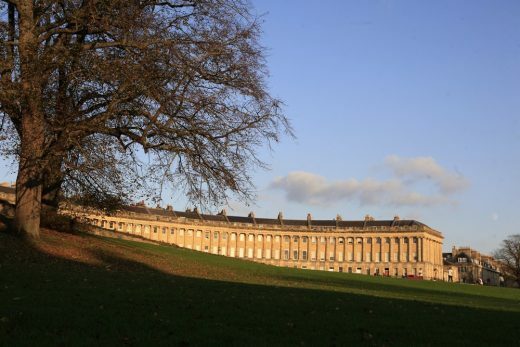 Turn your hand to carpentry and stone masonry on the three acre lawns or join a walking tour of the Royal Crescent for an insight into how the Royal Crescent was built. 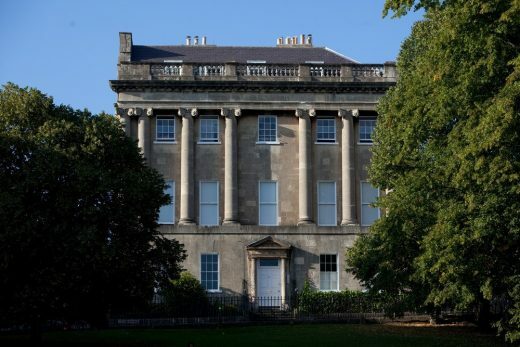 Bring a picnic to enjoy on the lawn and watch as the Royal Crescent is brought to life and taken back in time (29 July). Visit One Two Five and view Carole Waller’s stunning spring/summer collection of Art to Wear which has taken the Royal Crescent as inspiration. The collection, which includes blouses and shirts, shift dresses, jackets, palazzo pants and her best-selling scarves, subtly depicts the textures and colours of the Royal Crescent through broken up by blocks of colour and gestural brush marks. 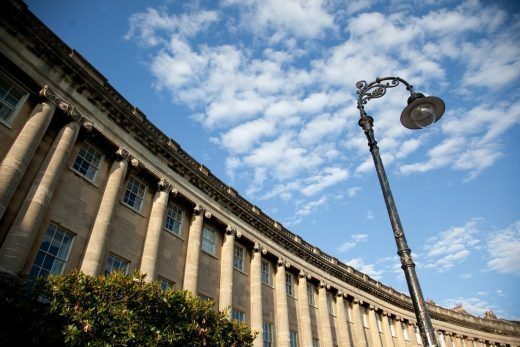 Enjoy a longer stay behind this famous façade and check in to The Royal Crescent Hotel & Spa for a once in a lifetime Suite Stay. Created in celebration of 250 years of the Royal Crescent the suite stay includes a specially created Taittinger Tasting Menu. 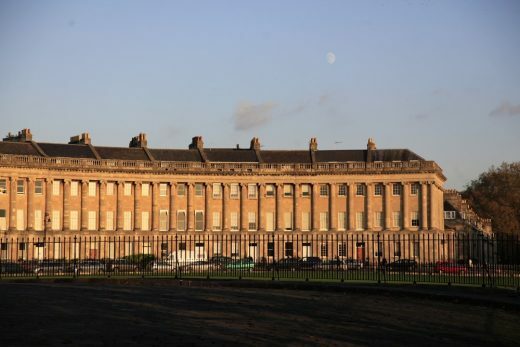 · The Royal Crescent was originally named simply The Crescent, only gaining its royal accolade at the end of the 18th century following Prince Frederick, Duke of York and Albany’s visit. 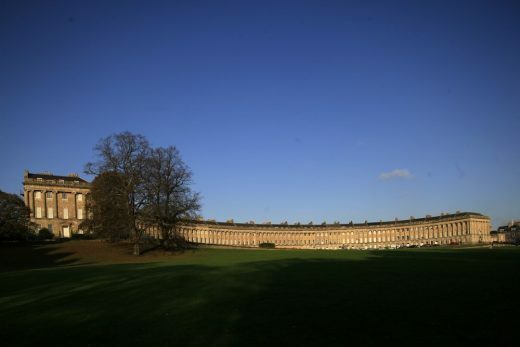 · The Royal Crescent has 114 Ionic columns, each 30 inches in diameter and reaching 47 feet. 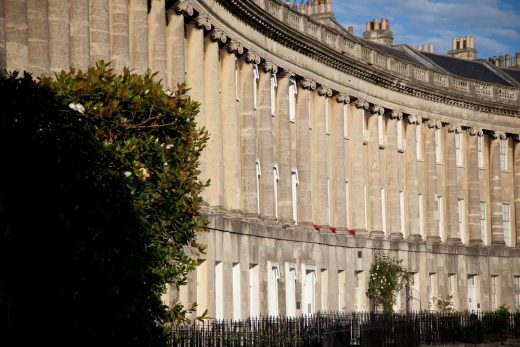 · Whilst the façade of the Royal Crescent may look uniform the rear is a jumble of differing depths and roof heights. These ‘Queen Anne fronts and Mary-Anne backs’ are a result of each house being built by a different architect, who, whilst obliged to follow John Wood the Younger’s specifications for the façade were under no such obligation for the rear of the property. 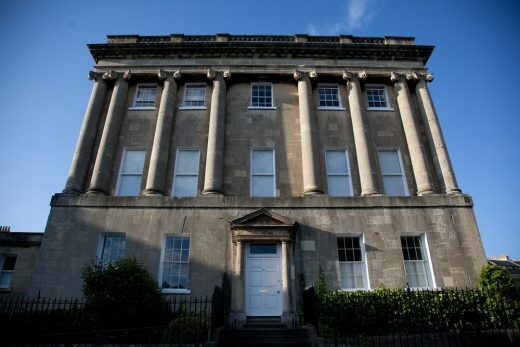 · During the Baedecker Raids on Bath both number 2 and 7 were gutted by incendiaries. · In 1972 the resident of No.22, Miss Wellesley-Colley painted her front door and windows primrose yellow instead of the traditional white. Miss Wellesley-Colley had to fight two enforcement orders from Bath City Council and defend herself at a public inquiry, before it was declared that the door could remain yellow. 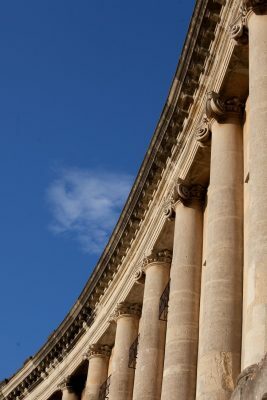 No other building better represents the architectural innovation, social identity and creative imagination of Georgian Britain than the Royal Crescent in Bath. 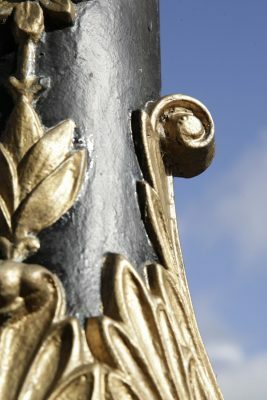 The foundation stone for this masterpiece of eighteenth century design was laid on 19th May 1767 and since then it has become one of the most famous buildings in Britain. It stands as a doorway through which the history of the Georgian period can be discovered and the architecture of the future inspired. 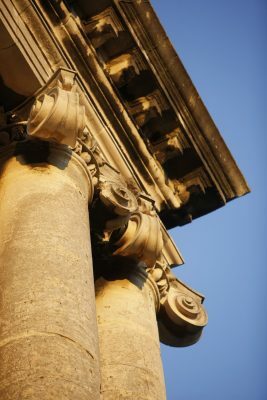 Bath Preservation Trust is a local amenity group and registered charity. 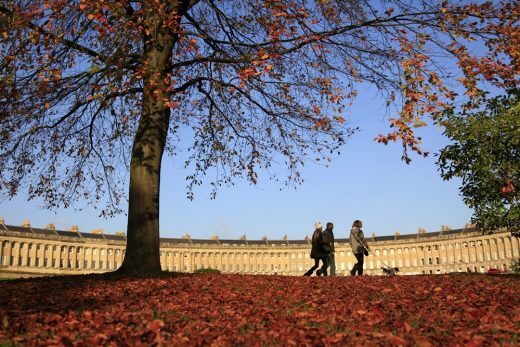 It was set up in 1934 to safeguard the historic city of Bath, now the only complete city in the UK afforded World Heritage Site status. 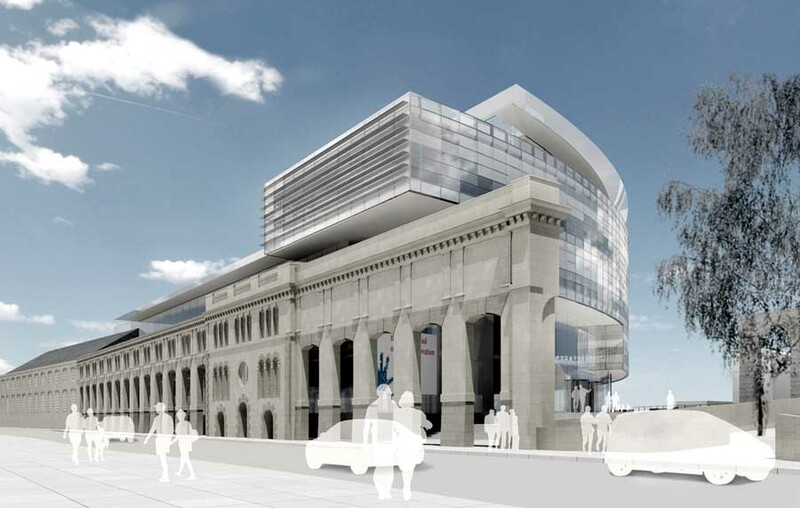 · to provide educational resources, including museums, which focus on the architectural and historic importance of the city.